In México, Christmas dinner is the most important family gathering celebration of the year. It takes place the night of Christmas eve, this is likely due to this night is the ninth and last of "Las Posadas", an old Mexican tradition with catholic roots consisting of nine days of praying and singing as a previous preparation for celebrating the birth of Jesus Christ. It is also a clever excuse to have a new gathering right on Christmas day afternoon and end the leftovers. Families enjoy around the table with traditional dishes, which recipes pass from generation to generation. Some traditional plates stand since pre-Hispanic days such as "los romeritos", "los tamales" or "el ponche" which is rather a concoction of fruits mixed with a strong sugar cane distillation. Some other dishes witness our Hispanic heritage as "el Bacalao a la Viscaina". Roasted pork, pozole, fish and other many regional dishes are the mainstray at the table of many families; however, above all, Christmas day is pretty much Mexico's turkey day. This is why I would like to share with you, the recipe to prepare "Tlahuanki Ueixolotl" which stands, in ancient nahuatl language, for Drunk Turkey; a savory tequila soaked roasted turkey. Important Notice: Read thoroughly and throughout instructions before setting and buying anything. 2 to 3 tequila bottles of your selection. I would rather prefer a young white tequila instead of an "añejo" (aged) one but it is up to your taste. Method: 1. Cut several lemons into wedges and sprinkle some salt over, reserve. Gently pour tequila in a double shot glass up to the rim. 2. Whip up the tequila and swallow it, then immediately squeeze a salt sprinkled lemon wedge with your teeth and make a funny "sour pickle face" (Arney, B., 2000). 4. Have another tequila shot. 5. Rinse the turkey thoroughly. 6. Have a couple extra shots of tequila. 7. "Oven the Light up" …BUM! 8. If still around, glass another tequila of drink. 9. Get the oven into the turkey. 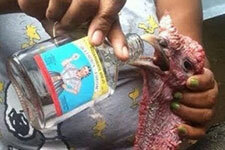 If too much hassle and struggle, hand a bottle to the unruly bird and have a drink you both. Cheers. 10. Repeat former step until turkey is tender enough. 14. Make sure the turkey is still inside. End the bottle. Take a nap. Ho, Ho, Ho, hope you liked it, have a MERRY, MERRY CHRISTMAS!